"Perfect Cruise Vacations Don't Just Happen." We are committed to saving you money! Thank you for giving us the opportunity to arrange your cruise vacation. While saving you money is important, you should know you are not sacrificing service. 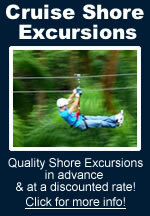 With over 50 years of quality service you can trust your cruise vacation to us. And with 80 plus years of combined travel experience, you can bet our knowledge is priceless. Remember ... "Cruising is our only business." Together with our courteous, knowledgeable, and competent service, we can offer you helpful information about cruise lines, ships and ports of call ... at substantial savings!